Wild Geese II? – Wild Goose Festival in NC June 21st – 25th 2012 | Truth with Snares!? 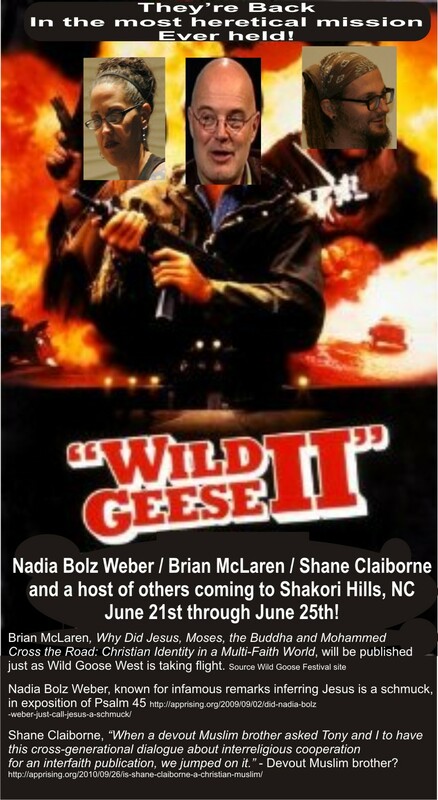 I’m not talking about the poorly rated 1985 war movie Wild Geese II but something deserving of lower ratings, what I dub the Wild Goose Festival II being held this coming week June 21st – 25th 2012 at Shakori Hills, NC. Apprising Ministries drew attention to this growing cesspool of heresy with. Gay, Tattooed, And Generally Liberal Folk On The Emerging Wild Goose Chase and Outreach Report 6-23-2011: The Wild Goose Chase! – GCN “Gay Christian Network” documented with table at WGF and more. Next, Truth with Snares brought attention to these wild geese of the Wild Goose Festival that some migrated west for the Soularize conference in San Diego in last October: Soularize – Wild Geese Migrate West And To The Far Left. Speakers include (list from the WGF site): Dave Andrews, Leroy Barber, Scott Bass, Melvin Bray, Brian McLaren, Rita Brock, Shane Claiborne, Julie Clawson, Ian Cron, Sarah Cunningham, John Dear, Laura Dunham, Cathleen Falsani, Gareth Higgins, Peter Illyn, Philip Jackson, Nelson Johnson, Joyce Johnson, Logan Mehl-Laituri, Justin Lee, Nikole Lim, Carl McColman, Joel McKerrow, Tema Okun, Christian Piatt, Maurice Possley, Alexia Salvatierra, Frank Schaeffer, Alexander Shaia, Phil Snider, Anthony Smith, Jimmy Spencer, Mike Stavlund, Erin Swenson, Phyllis Tickle, Margot Starbuck, Tim Tyson, Joy Carroll Wallis, Jim Wallis, Pamela Wilhelms, Randy Woodley, Spencer Burke, Lisa Harper, Aljoise Knight, Chris Stedman, Mike King, Jonathan Wilson-Hartgrove, Karla Yaconelli, Jennifer Knapp, Vincent Harding. Certainly this is after their own “lusts” with a dung heap of teachers! Final comment, seeing the “big gun” name of Brian McLaren in the mix begs a question, does this mean McLaren fully gives his endorsement to the homosexual crowd? It is a question he has dodged a direct answer for some time as he shares yet another conference with those who see nothing incompatible in the homosexual lifestyle and living for Christ! McLaren is certainly not preaching against it! FATHER RICHARD ROHR is a Franciscan priest of the New Mexico Province. BRIAN MCLAREN is an author, speaker, activist and public theologian. A former college English teacher and pastor, he is an ecumenical global networker among innovative Christian leaders. His next book, Why Did Jesus, Moses, the Buddha and Mohammed Cross the Road: Christian Identity in a Multi-Faith World, will be published just as Wild Goose West is taking flight. – I am sure the flock will continue to grow as these “wild” birds come to a city near you!